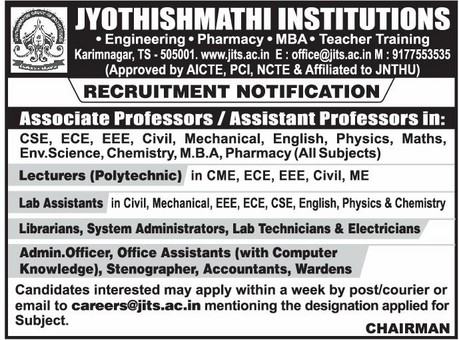 Jyothishmathi Institutions, Karimnagar has advertised in the EENADU newspaper for recruitment of Associate Professor / Assistant Professor / Lecturers Plus Non-Faculty jobs vacancies. Interested and eligible job aspirants are requested to apply within 07 days from 09th October 2018. Check out further more details below. About College: Jyothismathi Institute of Technology and Science, Karimnagar was established in August 1997 as a self-financing Engineering College by Shalini Vidya Samstha, Karimnagar under the able Chairmanship of Sri. J. Sagar Rao Garu who has vast experience in successfully running the Jyothishmathi Group of Institutions in Karimnagar & Hyderabad. The Institute is approved by the All India Council for Technical Education (AICTE), New Delhi and is affiliated to Jawaharlal Nehru Technological University (JNTU), Hyderabad. How to Apply: Interested and eligible candidates are requested to send application along with their CV, copies of certificates and recent PP size photo to the email address or postal address provided here. Mention the designation applied for in the subject line of email if you apply by email.